This is Lucy here – Sarah’s fiancee…. I am sat in my kitchen tapping away at some expedition admin, knitting some Christmas hats, dressed in my shorts and a T-shirt. Why? Because I can! I have piles of cold weather and camping kit dotted around the living room, which my lodgers kindly jump over every time they enter and exit the room. My bike has had a refurb and is in the kitchen waiting to be boxed up for the flight. As I listen to the boiler kick in and the bubbling sounds of the kettle, feeling the fluffiness of the slippers I’ve just found under the table and put on, I find it impossible to imagine what I shall feel like in a week’s time, once I am with Sarah in Canada for the bike ride. One question leads to a ream of kind curiosity and concerned confusion, which leads me to think I should be a bit worried about what the next couple of months will bring. Maybe the fear will kick in on the plane, but for now I’m quite happy living in ignorance and knowing I shall be in good hands, that the bears have gone to sleep and hopefully I can be of some use to Sarah out there too – Chief Tent Putter-Upper perhaps, Sock Warmer, and Christmas Carol Singer – that kind of thing. If you read Sarah’s blogs back in the summer, you’ll know that she surprised me for my birthday inbetween the kayaking/biking legs and what a fantastic surprise. It was the bestest ever surprise. We had a whirl wind week, nearly giving my Gran a heart attack when Sarah waltzed into the living room where she was quietly knitting. 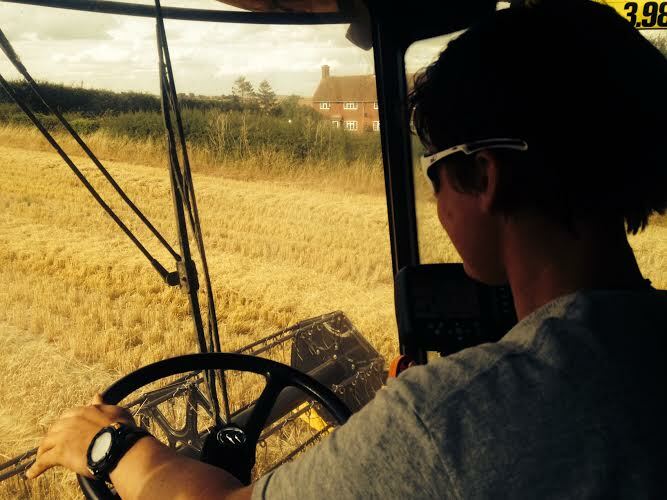 Sarah learnt how to drive the combine (a little too excitedly at times) but did very well and only fell asleep twice. She got a little taste of the farm in the summer before getting back to Alaska, worlds apart from home. I didn’t quite have time to experience all the emotions I normally do when Sarah goes away (which is a blessing!) knowing that just in couple of months I would be seeing her again. So, as I wind down my life for this year in the UK, wishing my hockey and rugby teams that I’m leaving behind luck in their remaining matches and apologising for my absence, I am filled with pure excitement thinking of the adventure ahead. Albeit, it is a pixel in a picture compared to Sarah’s days and months out there, but nonetheless, an adventure. A very big thank you to my fantastic parents (and the animals!) for letting me have such a lovely chunk of time away with Sarah. The best Christmas present ever. All in all, I’ve had a very lucky year. I am hoping the next blog is a happy one, whereby the risk of nearly frost bitten digits is still a novelty and that we are still singing the Frozen soundtrack at the tops of our voices. Wish I could have met you here in Alaska as I did Sarah—finally! I was fortunate enough to meet Sarah as I drove 432 miles roundtrip to bring her a banana and some salt. It was a pleasure and an experience I’ll never forget. Sarah is such a warm, friendly person, and I am sure you are the same! No doubt you will be on the adventure of a lifetime, but have a good companion to lead you safely through it all! I look forward to reading your take on what the ride is like as well as Sarah’s viewpoint. Wishing you safe travels on your rendezvous with Sarah. How cold is -22 C? REALLY cold – but only when the wind blows. When cycling, the wind blows with your movement. You will do fine if you get the right clothing. Canadians have been enduring this cold for a long time. If you aren’t used to it, the first time might be rough. Ah well, with a cheery pal like Sarah, you will have a jolly time. I’m a bit disappointed that Sarah’s journey paddling put her into Alaska, as I live on Vancouver Island and would have loved to meet. Another time. Have a wonderful time Lucy! At least you won’t have to worry about chocolate melting! Good luck Lucy, hope it’s a beautiful and exciting ride for you both. And stay safe from trucks etc. Will be sponsoring your miles of course! It sounds like quite a challenge but what joy for you to be together for those few weeks! Have a great time! Bring merino wool underwear, light and medium thickness top and bottoms, as that is how you will survive. Plus it does not stink if you do sweat. Warmer weather is on the way. Huge hugs and lots of love and warm wishes to you ….and to Sarah too. I’m sure there will be wonderful times and some challenging times– because that’s life. However, I trust that your view on things is similar to Sarah’s, and you’ll quickly find the positive amid any challenges. I hope you both continue having grand adventures! Sarah, …This has nothing to do with your above story, but my wife says, with hands on hips, “Sarah, you get right back here to Langley, BC. You’re supposed to come for supper!” hahaha I told her I’d tell you. It’s just that most of our population is down near the Can/US border, so you are (luckily?) missing the more modern, built-up Canada (which you will, no doubt, run into later). So glad you are getting into the humans who live up there. I like the North myself. Good speed and traction to you, girl. You will not want for reasons to snuggle at night. The -20 to -30 weather will quickly put you in the mood. Take care, eat lots, be careful, and you two are really certifiably nuts for wanting to peddle in the winter. Way to GO …. LUC !!!! Pretty soon we’ll be saying WELCOME TO CANADA, EH ? Oh she’s cold out here… but you’ll get use to it ! Your a farm girl !!! Not a problem !